The primary role of the Vessel Traffic Information Centre (VTIC) includes long term planning, reviewing bookings and coordinating vessel movements. 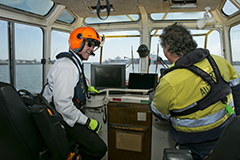 VTIC staff communicate with vessels arriving at the port, at anchor and within the port, providing them with information about anchoring and pilot transfer - which is by helicopter or cutter. 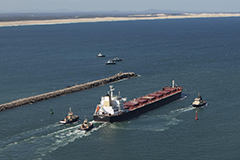 VTIC staff also liaise with Port of Newcastle Operations Pty Ltd vessel schedulers, berth operators, ships agents, duty pilots, tug and lines companies. The VTIC provides a single point of contact for emergency reporting within the port limits and also ensures compliance with port procedures and regulations. The operators also have coast radio responsibilities to listen out for distress and emergency calls from non-SOLAS vessels. 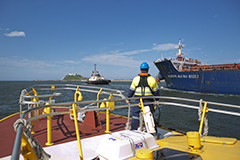 Under New South Wales law, Port Authority exercises certain port safety functions for the port which includes rules relating to the arrival of vessels under the Vessel Arrival System (VAS) process. In certain weather conditions and other circumstances, an increased number of vessels at anchor off the port increases the risk to port safety. 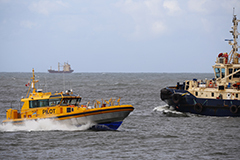 Port Authority uses the VAS to assist in the discharge of its port safety functions and achieve the safer operation of the port and enhance the safety of vessels using the port. The VAS monitors the vessels progress to the port when a vessel is 15 days away from the port. The vessel participating in the VAS are required to provide a Berthing Notification Form (BNF) to Port Authority. The vessel traffic system (VTS) is used to track vessels that are within the vicinity of the port. The efficiency of the port is driven by the efficient and effective movement of vessels into and out of the port and the optimisation of berth usage. For details on the Vessel Arrival System, please review the Vessel Arrival System Letter and Rules.